The (fairly) cold weather we've had this past week made me crave hot soup. 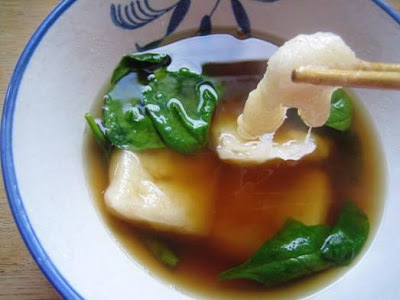 I could whip up some ozoni! Now THAT's comfort food: a simple soy-sauce broth (like udon soup) with mochi rice cakes and whatever veggies and protein you want to add. 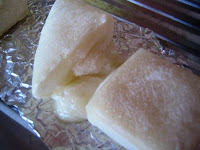 Ozoni is typically consumed at New Year's, as I explained in my earlier post about mochi. And it's more a home-cooked dish, not readily available at restaurants, though I just learned that Suehiro Cafe in Little Tokyo does serve ozoni, and year-round, at that! Good to know for those emergency ozoni cravings. 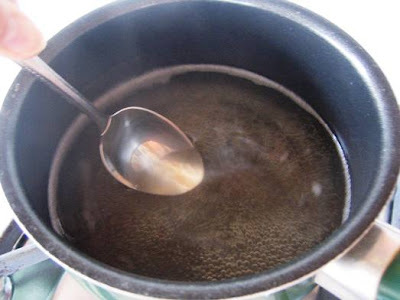 From left - Japanese dashi, or fish stock (I use the powdered version, sold in packets, for convenience, but real stock is made by cooking dried bonito in boiling water); sugar; and soy sauce. 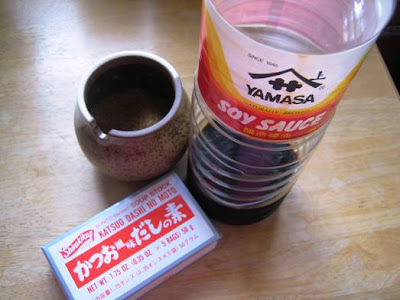 Next, I added about half a tablespoon of sugar, and a whole tablespoon of soy sauce. I don't like to overdo any of the flavors, so I've found this balance to be perfect for my taste. You can add more of any of the ingredients, according to your taste. 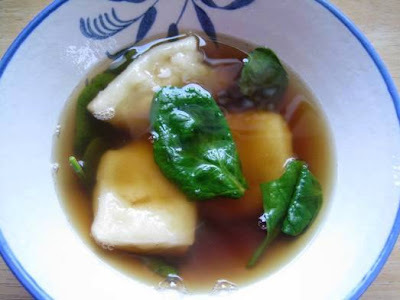 You can also add fish cakes and vegetables (typically spinach and napa cabbage) to the soup for a simple, traditional ozoni. Or add beef or chicken, if you prefer; I enjoyed a delicious, premium version of ozoni this year that included snow peas, thinly-sliced carrots and pieces of chicken, prepared by my cousin's mother-in-law, a phenomenal Japanese cook who lives in San Francisco. Of course, I got my mochi from the annual family mochi making in January, but you can buy mochi in Japanese grocery stores (at the Gardena Marukai, you'll find the plain mochi rice cakes near the bakery section toward the front of the store). 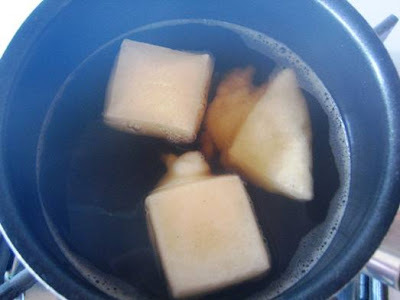 Toast until the mochi starts to expand a bit (note the gooey glob oozing out of this rice cake, at right) then take it out quickly and drop into the hot soup. 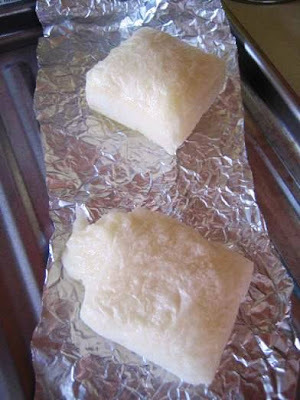 The mochi will soften and can even start breaking up if kept in the hot bath too long, so serve after just a couple of minutes on the stove. As you can see from the photos, I kept my ozoni simple and just tossed some spinach leaves into the broth right before eating. Warm, tasty, satisfyingly chewy, and comforting.